Halloween is fast approaching and many of you will be deciding on or have already decided what your choice of outfit will be this year if you are going to or having some sort of Halloween celebration. Myself and Simon are off to a house party so keep an eye on my Instagram to see our outfits, we are going as each other so it should be rather amusing, and very very scary! As we have found out over the last week whilst looking for props for our outfits, wigs can be very expensive and a much cheaper alternative is to colour your own hair rather than buy a wig and today I have some great products from the brand Pimps & Pinups to show you how you can colour your own hair without having to go to the salon. Who are Pimps & Pinups? Pimps & Pinups are a hair salon based in London and New York, they also have a range of specialist hair products, the High Voltage Hair Pop Paint being part of that range. High Voltage Hair Pop Paint comes in 6 vibrant colours that allow you to achieve an edgy new look without spending hours in the salon. 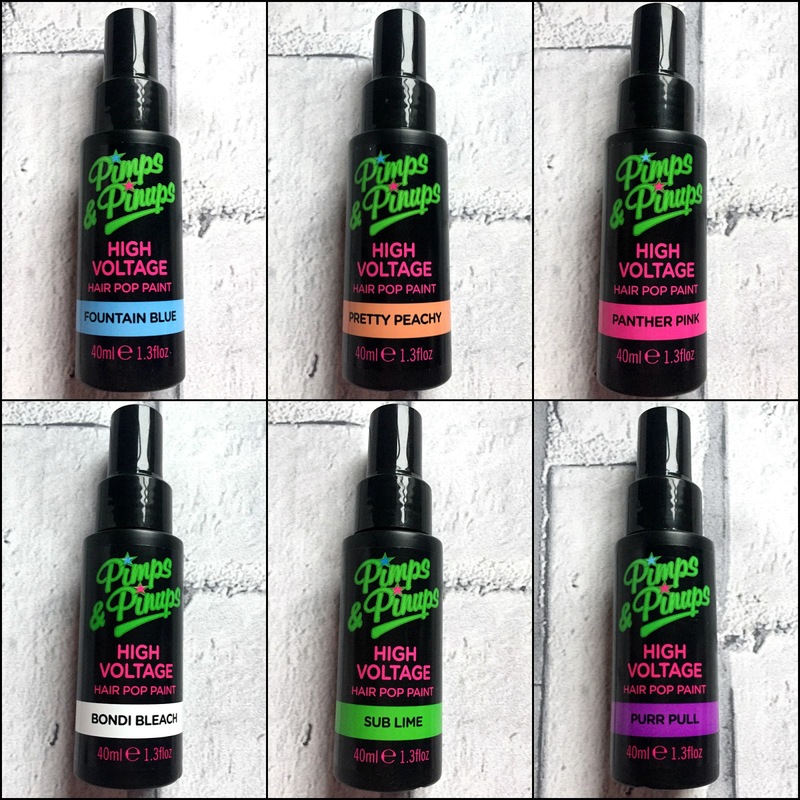 With easy application and zero mess, High Voltage produces instant colour that won't drip or stain the skin. The colour easily washes out making it the perfect go to product to make a bold statement. The first ever to work on blonde to black hair and everything in between. 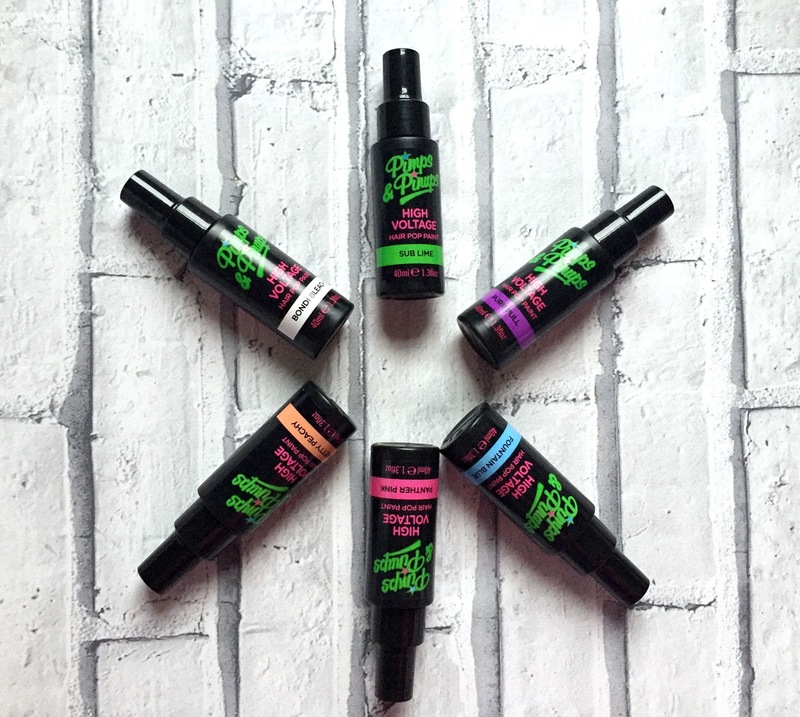 The Hair Pop Paints come in a black plastic spray bottle with a black plastic pull off lid, they have a spray nozzle to apply the product. The shade of the Hair Pop can be clearly seen on the front of the bottle. Each bottle contains 40ml. 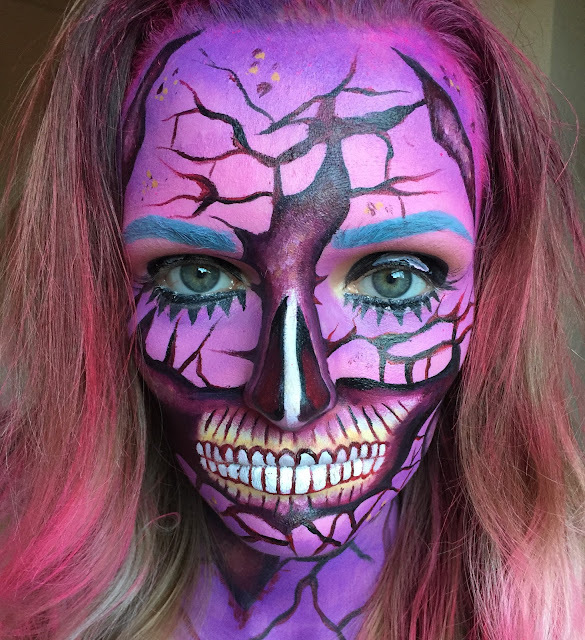 My eldest daughter Cole is a professional makeup artist and Halloween is one of her busiest times of the year, she has a lot of clients booked in but she also likes to create 2 or 3 looks every year on herself to show her clients and potential clients what she is capable of. The day after I received the Hair Pop Paints, Cole was creating her first Halloween look of 2016 and asked if she could use them, of course I said yes, because who better than Cole to try out the Hair Pop Paints? 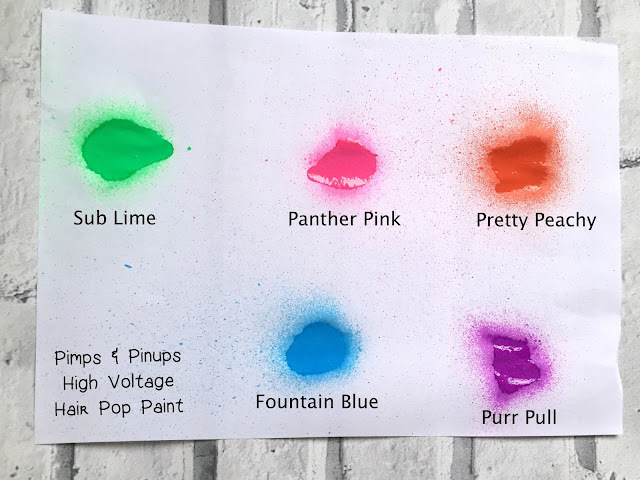 I received all 6 shades of the Hair Pop Paints, the shades are Fountain Blue, Pretty Peach, Panther Pink, Bondi Beach, Sub Lime and Purr Pull. For her first Halloween look, a broken doll, Cole used Panther Pink, Cole said the Hair Pop sprayed with ease and she didn't have to push down hard on the nozzle, Cole sprayed the Panther Pink on most of her hair for a vibrant look. Cole thought the Hair Pop was easy to use but she would advise covering dressing tables, vanity area's and clothing as the spray did transfer onto hers, it did wipe off with some cleaning solution so no harm done but it is something I thought I should mention. The Hair Pop leaves a kind of hair spray, crisp type feeling to the hair and Cole was able to style her hair using it, the more spray she used the more crisp her hair felt so where she had used most of the Hair Pop near her roots, her hair felt like she had used hair spray. The Hair Pop washed off Coles hands easily with soap and water. Some of Coles hair is bleached and the Panther Pink clung a little to the bleach, meaning Cole had to wash her hair more than once to get the pink out of her hair, it was easier to remove from the areas of her hair that aren't bleached but if you do have bleached hair you may need to wash it a few times to get the colour out. I also sprayed the Hair Pops in my partner Simons hair because he has black hair so I wanted to test how well they showed up, and the colour did show up really well. Cole has naturally mid brown hair with bleach in parts and the colour showed up fine on her hair too, Simon was able to wash the Hair Pops out of his hair using a normal shampoo. I sprayed the Hair Pops onto a sheet of white paper to show you how the colours come out, I couldn't show you Bondi Beach as it is white and wouldn't show up but it is just a regular white spray. I would agree with Pimps & Pinups that the Hair Pops are easy to use and they don't stain the skin, but they can be a little messy and I wouldn't advise using them near any clothing or furniture that you don't want coloured but I would have assumed that anyway using any spray hair colour to be honest. They are a great way of adding colour to your hair that will wash out but look great and are brilliant for any kind of fancy dress or Halloween looks. If you want to create a Halloween or fancy dress look or you just fancy a change of hair colour and you want a vibrant colour that will show up on any hair colour and wash out again, I would recommend picking up the Pimps & Pinups High Voltage Hair Pops. 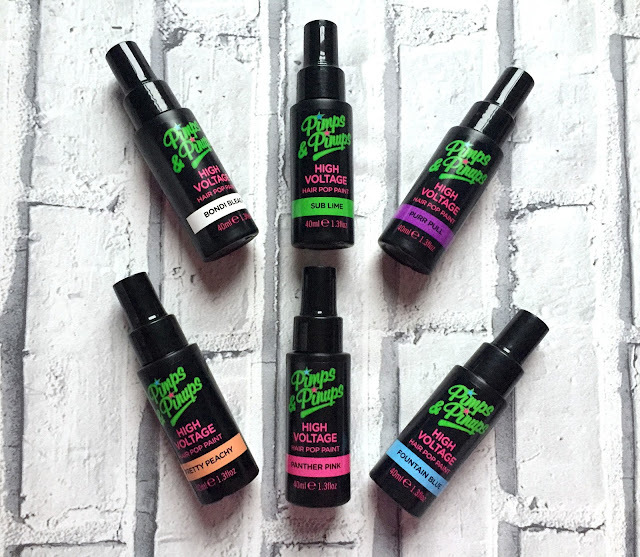 You can find their range on the ASOS website HERE, the High Voltage Hair Pops are priced at £7.99 each. And before I go I will show you the Halloween look that Cole created and her Panther Pink hair. Are you dressing up for Halloween this year? If you are, let me know in the comments section below what you are dressing up as.